I think you pretty much know what social media is: we’re talking about sites such as Facebook, Twitter, and the more recent addition — Pinterest. The problem with Social Media is: there’s so much choice available to us, and if we don’t get the right recommendation and guidance on where to focus and concentrate our activity, we can get lost jumping from one web site to the next, producing zero results. This is a 45 minute recording of a tele-seminar I did in 2012 with Cheryl Scoffield, the Follow up Queen. Over the last 5 years I’ve tried using 3 completely different social media outlets: Facebook, Twitter and Linkedin. I got onto Facebook very early on, as soon as that site hit the mainstream, used it for about a year or so, and then got scared off by privacy issues. Today I only use Facebook for personal stuff. My romance with Twitter was even shorter. Although today I still use Twitter and have several accounts, my use of Twitter is very limited. To me using Twitter is a like crashing a party where everyone is talking to each other and I’m trying to make sense and join in a conversation. Linkedin was and is a totally different experience. I started using this site back in early 2008, when my wife got laid off and I was helping her set up a home-based consulting business. Linkedin seemed like a logical choice then because it was – and still is – very much business-oriented. 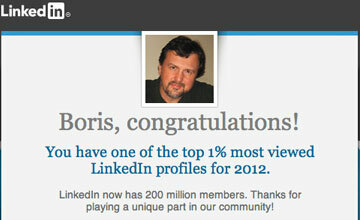 After a year or so of actively using Linkedin I started seeing business results from my Linkedin activities. If you can only select one site, then the social media outlet you really need to be on is Linkedin. One of the reasons I like Linkedin is because it has a simple, single-minded goal: help you build business connections and in the process, help you generate quality leads and prospects who recognize you as the expert in your field. The trouble with Linkedin, as with any new tool we’re not familiar with, most people don’t know how to use it properly, so they are struggling to make it work. About 3 years ago I used Linkedin Polls application (now defunct) to ask Linkedin members one simple question: How much money have you made using Linkedin in the last year? The results were worst than I expected: 58% of respondents said they made nothing in new business. I repeated the survey in Dec, 2011, with a bigger sample – over 400 respondents this time – but with similar results: 51% selected $0 as their answer. There is a silver lining to this actually: 21% of respondents indicated that they have made more than $10,000 in the last year on Linkedin. So I think there’s great potential, people simply need to learn how to use Linkedin properly to start generating new business. About two years ago I started hosting a live seminar series I call Linkedin to the Max. This is a half-day workshop where I spill the beans and reveal all my secrets on how I generate 20% of my income from Linkedin. The 1st thing you need to do is complete your Linkedin profile, but the good news is, Linkedin will give you tips on what to do next to get to 100% profile completeness. Once you’ve completed your profile with basic information, start looking at your current position or positions (many entrepreneurs will have multiple current positions or businesses – that’s OK) but also at your past positions. (infographic) Linkedin for Business: Are You Making Money Using Linkedin? Are you using Linkedin for business? Are you a small business owner, or self-employed professional trying to generate sales using this business networking site to generate leads, and drive traffic to your web site or brick-and-mortar store? According to this poll I conducted on Linkedin, 51% of respondents said they made no money using Linkedin. I asked Linkedin members one simple question: “How much new business have you made on Linkedin in the last 12 months?” You can see the results of this poll by referring to the infographic below. The poll generated 419 votes, and 59 comments. In February 2008, I conducted my first poll asking this same question, and the results were very similar. I have a feeling that a lot of people are invited to join Linkedin, so they create a profile, but then get stuck because they don’t understand how Linkedin works. Linkedin is just a tool, and it won’t work by itself, you have to learn how to use it. First of all, you need to complete your profile. Linkedin will give you suggestions on what to do next, such as “add your photo” or “ask for a recommendation”. If you’re using Linkedin for business, don’t upload a logo of your business or company to your personal profile. Your Linkedin profile is for your personal information, so upload a recent photo of you. It doesn’t have to be a professional “head shot” as long as it clearly shows you. Next, add all your current and past positions, even the ones you may think don’t relate to what you’re currently doing in business. Make sure you ask your current clients to recommend you.